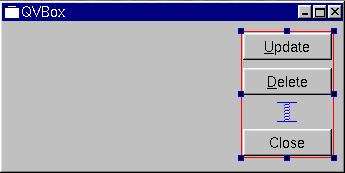 This class is used to construct vertical box layout objects. See QBoxLayout for more details. See also QHBoxLayout, QGridLayout, the Layout overview, Widget Appearance and Style, and Layout Management. Constructs a new top-level vertical box called name, with parent parent. The margin is the number of pixels between the edge of the widget and its managed children. The spacing is the default number of pixels between neighboring children. If spacing is -1 the value of margin is used for spacing. Constructs a new vertical box called name name and adds it to parentLayout. The spacing is the default number of pixels between neighboring children. If spacing is -1, this QVBoxLayout will inherit its parent's spacing(). Constructs a new vertical box called name name. You must add it to another layout.